Autumn is a special time on Cape Cod, so enjoy it to the fullest on this luxury coach tour and scenic sightseeing cruise, affording amazing views of New England's colorful fall foliage. From Boston, learn about the sights you see from your guide as you travel in comfort through Quincy, passing the birthplaces of two American presidents. 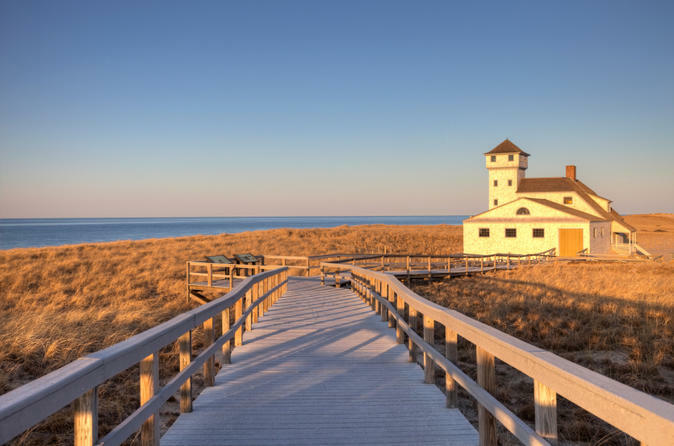 Stop in the town of Sandwich and the Sandwich Glass Museum & a glass blowing demonstration, see the John F Kennedy memorial in Hyannis Port, and then relax on your narrated cruise along Lewis Bay. This tour begins with a convenient hotel pickup for selected hotels in downtown Boston and several suburban hotel locations. After crossing the Cape Cod Canal, we’ll stop in Hyannisport, where we’ll visit a memorial to President John F. Kennedy and a nearby beach. We join a narrated sightseeing cruise of Hyannis Harbor, which offers the best possible view of the Kennedy Compound. Time is provided for shopping and lunch on your own at one of the many nearby restaurants after the cruise. Then travel down the 'King's Highway' through historic Sandwich and stop at the Sandwich Glass Museum. The museum exhibits nearly 5,000 pieces of glass produced at the Boston & Sandwich Glass Company between 1825 and 1888. You will have the opportunity to watch a 20 minute glass blowing demonstration that is truly enthralling. Additional free time is provided to explore Sandwich. Please note: This tour is seasonal and operates from September through October only.